Last year, President Donald J. Trump’s infrastructure plan was yet to be realized. This year, there was movement. In October, Trump signed the America’s Water Infrastructure Act (AWIA), which calls upon the U.S. Army Corps of Engineers to develop five-year plans through 2024 for water projects. The bill provides $3.6 billion for the Water Infrastructure Development Act, which can be used to institute workforce development programs. As usual, Water & Wastes Digest conducted a survey of its audience to determine some significant factors of 2018 and projects for the following year. This survey was conducted by the marketing department at Scranton Gillette Communications, the parent company of WWD. A total of 196 individuals started the survey, and 98 completed it entirely. The primary job function for 63% of respondents was either operations or engineering, with operations making up 36% of that figure. Twenty-three percent were government administration and corporate management. Similarly, 76% of respondents were age 50 and older. Only 2% of respondents to the questionnaire were 30 to 34 years old. 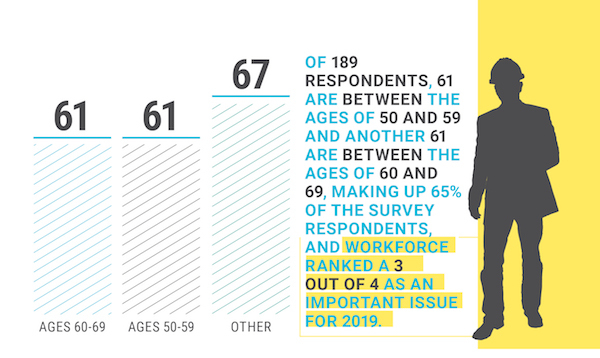 WWD does not see this as entirely representative of the industry, but rather more representative of the ages for the job titles and primary job functions of those responding. For example, an individual in government administration or corporate management is more likely to be over 40 years of age than under. That said, the age of the industry and the inevitable wave of retirements in the next decade are a critical concern around which people and agencies—such as the San Francisco Public Utilities Commission—are already strategizing. It is important to note the survey responses related to new construction and upgrades to existing facilities. Half of respondents said new construction was not on the table, but nearly 70% said upgrades are planned for the next 36 months. The degree of those upgrades is not explored—this simply could be ongoing maintenance planned a decade ago—but the volume of upgrades suggests that municipalities see a need for new equipment but not new facilities. The approximate annual budget for upgrades highlights another take on the matter of upgrades or new construction. Respondents fit into a budget category of $1 million or more at 47%, but the middle range of $100,000 to $499,000 makes up another 22% of respondents. Despite that budget availability, 48% of respondents note that their budgets have generally remained the same from the previous year. With a review of the survey conducted last year in which 50% of respondents said revenue increased, this year’s study suggests there has been a plateau in revenue relative to the previous year. Looking at the political climate around infrastructure funding and how little was known until the last quarter of the year, this makes sense. Uncertainty abounded for most of 2018, and the steel and aluminum tariffs added pressures on manufacturers for which they had not been entirely prepared. And for those importing from China, an increase on tariffs will start Jan. 1. Despite that, manufacturers have seen strong years, with several in the industry hitting record sales, and many of those manufacturers are anticipating that trend will continue into 2019. The items respondents deemed most important for the coming year are state and federal regulations and compliance issues, funding, maintenance and upgrades, workforce development, and preliminary wastewater treatment such as headworks and screens. While segments of the municipal market have struggled to invest in infrastructure, spending and budgeting for necessary projects has not faded entirely. John Masters, Danfoss vice president of sales – water, said much of that spending has been in energy efficiencies, particularly as it relates the purchase of drives. By investing in improved efficiencies, municipalities are thinking about long-term payoffs. Paul Turgeon, WWD editorial board member and CEO of Anue Water Technologies, said that overall, public utilities are finding it difficult to reinvest, but private-sector investment is starting to appear. Additionally, hurricanes and other disasters in the past year have contributed to necessary spending from municipalities regionally, and Masters said 2019 will bring an increased focus on state-level funding from revolving loans because of the passing of AWIA. For projects that have been on the back burner, Masters said the state revolving loan funds may be the catalyst to get projects completed. Ryan Godfrey, U.S. Water vice president of operations, said getting state legislatures engaged will be an important aspect of securing funding for projects because of the projected increase in state revolving loans. Godfrey and Masters said that public-private partnerships are effective, but only when municipalities or companies are large enough. Masters said companies such as Veolia and Suez that provide the operation services for large facilities have been effective, but the smaller utilities have not been as successful. The introduction and implementation of steel and aluminum tariffs has been one of the greatest impacts on the industry this year. There have been several separate determinations throughout the year. A 25% tariff on steel and a 10% tariff on aluminum were both instituted for most countries in March, and those tariffs were extended to the European Union, Canada and Mexico in June. Then in July, a 25% tariff on 800 goods from China was instituted; this also impacted manufacturers. The implications for this include price increases in equipment, disruption to delivery of equipment and delays in manufacturing. John Ballun, president of Val-matic, said the intent of the tariffs did not match with the end goal. The result of the tariffs, he said, was an increase in price on all affected products, meaning municipalities—and ultimately taxpayers—are absorbing the cost. He said this was similar for the tariffs instituted on Chinese imports. Godfrey said the struggle for municipalities to find funding is compounded by the tariffs. “We know the quantity [of needed work] out there and it’s an ongoing struggle [to fund it]... That struggle is being compounded by some of the inflationary pressures out there in the marketplace. The tariffs and that are having a trickle-down effect and will continue to have a trickle-down effect,” Godfrey said. In January, Chinese tariffs will increase from 10% to 25%. It is not clear if more tariffs are on the horizon or if any instituted in the past year will be reviewed or changed in 2019. In industrial water and wastewater, virtually every market is trending. Food and beverage, power, oil, gas, and agriculture irrigation have all become strong markets. Masters said water reuse in the food and beverage arena, notably by craft breweries and bottling companies such as Nestle and Coca Cola, is on the rise for those reasons. Water reuse is far-reaching, in fact. Companies such as Intel, which won a U.S. Water Prize this year, have put an increased focus on water management, and other major global companies are following suit. Turgeon echoed Masters’ sentiments on the increased importance of water reuse, and they both cited hydrofracturing as an area of growth in the industrial industry. Fracking, they said, uses a tremendous amount of water, so pretreating and re-treating creates a more cost-effective way to do business. Turgeon said those water needs and the political environment surrounding fracking have resulted in a push toward water remediation and treatment in the process. Kevin Millici, U.S. Water vice president of marketing and technology, said that despite the fear of abandonment of regulations and disregard for the environment, societal pressures have encouraged better water stewardship in the industrial industry. “No one is going to abandon that, if you will. There’s still going to be increasing regulation, in our view. There’s just a natural societal pressure to do that, so I don’t think economic pressures are going to overturn that societal pressure,” Millici said. In the wastewater treatment industry, a change of terms has become popular as states such as Arizona and Texas begin to create a framework for potable reuse. Municipalities and industry veterans are reframing the conversation on water by highlighting the value of wastewater and what is lost by not capturing that value in some way. This is not an anomaly. At the One Water Summit in July, market researchers presented ways to better reach the public and talk to regular people about water and wastewater projects. Instead of using words such as riparian, watershed and aquifer, they said to use terms such as lakes, rivers, and streams; land around lakes, rivers and streams; and groundwater. They found that the average person thinks a watershed is a building that stores water and they do not necessarily know what the term riparian means. By putting the focus on the tangible things and touching on people’s memories and feelings about places—like fishing at a lake house, swimming in the ocean or canoeing in a river—explaining the importance of treatment and advancements in treatment technology becomes easier. Millici said that the shift in calling facilities wastewater treatment plants, water reclamation facilities or water resource recovery facilities is a part of that overall movement. And by reframing wastewater treatment, opportunities for potable reuse may become more palatable for the public. The skilled labor shortage is another widespread issue in the industry. Several industrial and “blue-collar” industries are facing a wave of retirements and a lack of skilled workers to replace them. Godfrey said this is a critical issue that needs to be addressed from several angles. Despite those advancements in artificial intelligence and machine learning in water and wastewater treatment—the so-called smart water movement—utilities are finding new ways to reach students and encourage their participation in the industry. And with the passing of AWIA, Juliet Ellis, San Francisco Public Utilities Commission (SFPUC) chief strategy officer for external affairs, said there is opportunity for a grant program administered by the U.S. EPA. She said this would be a competitive grant process with around $1 million available to develop workforce initiatives in the first two years. SFPUC has been a major advocate for addressing this issue, and even has developed a far-reaching program that infiltrates local schools to expose students to job opportunities in the water and wastewater industry at a young age. The program shows them positions from jobs requiring only a high school degree to positions that need college education. From kindergarten to fifth grade, the material highlights how students interact with public utilities on a daily basis. In middle school, the focus is on science, technology, engineering and math, and by high school, the goal is to highlight available jobs.